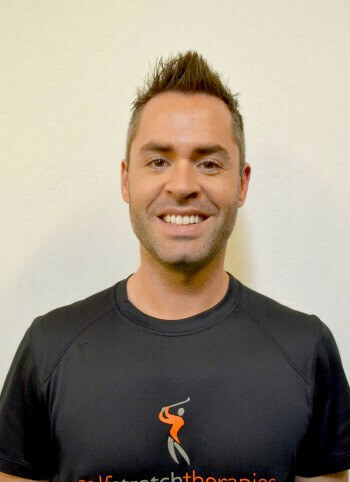 Adam Swanson is the CEO/founder of Golfstretch, a Sports Performance and Therapy center based in Scottsdale, Arizona. His unique combination of Neuromuscular Stretch Therapy, Corrective exercise, and Functional Training has helped his clients achieve their fitness goals, increase mobility, correct posture, and improve their everyday lifestyle. Adam has worked with a diverse range of clientele, from the humble weekend golfer to PGA Tour Professionals and NHL Hockey players. A Minnesota native, Adam attended St. Paul College and moved to Scottsdale in 2008 to broaden his study of bio-mechanics and sports medicine. He has competed in the RE/MAX World Long Drive competition; his longest drive to date is 423 yards, and currently holds a USGA Handicap index of 0.1. Adam strives to continue improving his golf game and advance his professional credentials as a sports mobility and performance specialist. Together with Doctors, flexibility and postural correction experts, Adam has contributed to the development of sports-specific stretches and exercises designed to decrease muscle and joint pain, increase range of motion, improve flexibility, and promote proper body awareness. This innovative approach has attracted the attention of athletes in many different sports. He obtains certifications as a Neuromuscular Stretch Therapist, CPR, AED, and from the National Academy of Sports Medicine as a CPT (Certified Personal Trainer), CES (Corrective Exercise Specialist), PES (Performance Enhancement Specialist), and a Certified Golf Fitness Instructor from the Titleist Performance Institute. Aching Back: Stretch It Out?